Sawgrass Country Club in Ponte Vedra, Florida. 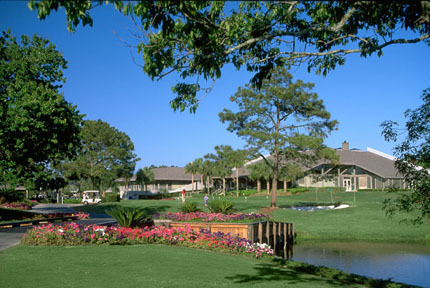 Sawgrass Country Club is located in beautiful Ponte Vedra Beach within one of the most picturesque and smartly developed gated, residential communities along the coast. It is situated on 1,250 acres adjacent to the Atlantic Ocean. While enjoying the beauty and benefits of a northeastern Florida barrier island, the community is just 20 minutes to the southeast of Jacksonville, the site of Super Bowl XXXIX, and just 20 minutes to the northeast of St. Augustine, the country's oldest city. In 1972, developer James Stockton Jr. broke ground on the Sawgrass development. Today, Sawgrass is home to The Players Championship golf tournament and is world headquarters for the PGA Tour, thanks to a legendary 1978 deal in which developers Jerome and Paul Fletcher sold PGA Tour Commissioner Deane Beman 415 densely wooded acres for $1. Sawgrass has many home opportunities with resales available for executive homes, patio homes, townhomes, and condominiums. Home prices from the $300's to over $2 million.